You must also be → remarkable and rememberable. ❶ Your brand is a totality of the thoughts, feelings, associations, and expectations a prospect or customer experiences when exposed to your company's name, its trademark, or its products. ❷ Your brand is your company's reputation and, therefore, your promise of quality. 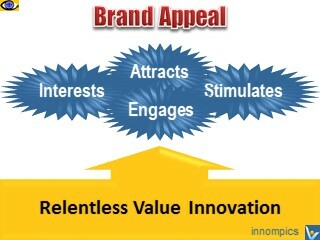 ❸ Your brand is differentiated from competitors and delivers unique relevant benefits to your target customers. The greater your brand is, the more benefits it delivers to your customers than your competitors. ❹ If you wish to build a great brand, you must deliver on your promise – every time, everywhere, in everything you do. "People want to express themselves through brands – brands express a person's personality and the people they like to be with." External: Branding seeks to distinguish your company, product or service from the competition and create a lasting impression in your prospect's mind. Internal: Powerful brands increase employee satisfaction, loyalty, and achievement drive. According to the American Marketing Association (AMA), brand is a "name, term, sign, symbol, or design, or a combination of them, intended to identify the goods and services of one seller or group of sellers and to → differentiate them from those of competition." Technically speaking, whenever you create a new name, logo, or symbol for a new product or service, you have created a brand. Marketing is not a battle of products, it's a battle of → perceptions. The power of a brand lies in what resides in the minds of customers – what they learned, felt, seen, and heard about the brand as a result of their experiences over time. When you have a brand that works for people, you should work the brand. what you know about your own company and the → customer value it creates. In today's Internet-powered and social media dominated World, hashtags emerged a new powerful branding tool. On social media web sites and applications, hashtag is a word or phrase preceded by a hash '#' and used to identify messages relating to a specific topic. The hashtag has gained prominence and wide acceptance since it was organically created by Twitter users as a way to organize messages into meaningful groups. Today, organizations and businesses use hashtags in more → creative ways. For instance, Innompic Games uses the hashtag #LovingCreators to attract more people globally to the world-changing Innompic Games that have the vision of turning Earth to the Planet of Loving Creators. This strategy worked perfectly from the very first global Innompic event. International participants of the 1st Innompic Games 2017 held in India were happy to contribute towards development of the Planet of Loving Creators.